Prices of accommodations at The Palasia Hotel are good for minimum 1 passenger hold TW passport per room. Return flight from Taipei to Palau Airport Transfers in Palau 3 or 4 nights accommodation. The fares below are per person and quoted in New Taiwan Dollars NTD. They are not valid during high season or holidays such as Chinese New Year or Easter are subject to change without notice. The Republic of Belau (the traditional name) better known as Palau is located to the southwest of Micronesia and consists of an archipelago of 343 islands. 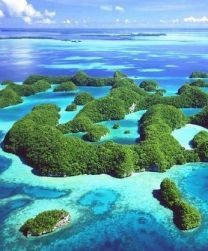 Palau's famed "Rock Islands" are a collection of rounded, foliage-covered isles which seem to float above the surface of the water. A boat trip through them will reveal many magnificent white sand beach hideaways perfect for a secluded picnic or adventurous overnight stay. Below the water's surface, divers and snorkelers are treated to a diverse technicolor paradise of fabulous drop-offs, blue holes , breathtaking reefs, crystal caves and World War II wrecks. Palau is one of the most extraordinary diving spots in the world due to it's profuse, unspoiled reefs that offer a wealth of marine life, coral formations and wrecks. Dives begin in knee deep water and plunge straight down to depths of 1000 feet and more. Blue holes, huge caverns and an immense variety of rare and exotic marine species are easily accessible in clear water. Vast numbers of large pelagic predators, sharks, turtles, dolphins and many species of migratory fish gather here at a unique crossroads of three of the world's major ocean currents. Land locked marine lakes, accessible from the sea through tunnels beneath the island's steep shorelines, are home to rare jelly fish, anemones and soft corals. Reserve today as seats are limited! Please note that a minimum $U.S 5 tip per person is expected each way for your driver. A full amount deposit required to reserve your seat.